Hello and welcome to the first part of our Knitting For Beginners Series! Over the next few weeks, we are going to talk about the basics of knitting and I’ll guide you through making simple projects you’ll love. These lessons are designed for beginners, so I’ll break down each lesson as simply as I can and provide videos to help you out too. Today, we’re going to start off by talking about the tools you need to start knitting! Over the years, my knitting stash has grown to include every little notion and accessory I could even think to use, and then some I don’t use at all. It’s a stash of knitting tools that I’ve built up over time and as I learned new skills, but when you’re just starting out, there are only a few things you need. Rather than give you a long list of all of my favorite tools, I’m going to focus on just the couple of things you’ll need in this Knitting for Beginners series. I’ll tell you a little about what each tool is and how we’re going to use it, along with a link to my favorite and where you can get it for yourself. 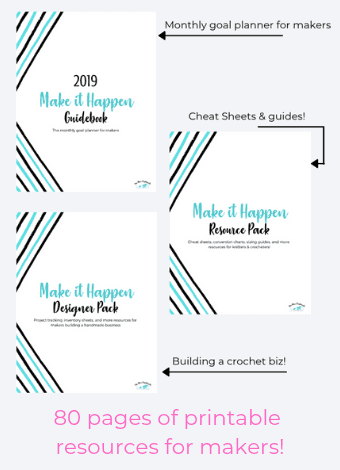 If you’re looking for some simple crochet lessons as well, be sure to check out my Beginner’s Guide to Crochet Ebook and get the free lessons on crocheting too. They’re similar crafts and both are a lot of fun! For now, let’s start by outlining some of the basic tools you need for knitting. The most important thing you’re going to need is some knitting needles! There are a few kinds of knitting needles and they all work a little bit differently, but any will get the job done. Straight knitting needles are the ones you see most often. They’re just long sticks with a point on one end and have a stopper or knob on the other end to keep your stitches from sliding off. That end will also include what size the needle is. Straight needles come in all different sizes (thicknesses) and lengths for different types of projects. These are usually recommended with knitting for beginners, but I find them a little lacking. You can create flat pieces with these, but you can’t work in rounds and the length of the needles can make it cumbersome to work. So although they are a great place to start, and you can pick up an inexpensive set anywhere, they aren’t my favorite. These are the ones I started with and the sizes we’ll be using in future lessons. Double pointed needles are another type of straight needle, which we won’t get into now. You won’t be using them anyways. My favorite types of knitting needles are circular needles. These include two needle tips attached to a long, flexible cable and they are the most versatile type of needle. You can use circular needles to work a piece back and forth to make something flat like a scarf. But you can also use these to work in rounds to make something tube-shaped, like hats and socks. Circular needles can come as fixed circulars which are a certain size needle tip attached permanently to a certain length of cable, or you can buy a set of interchangeable circulars. 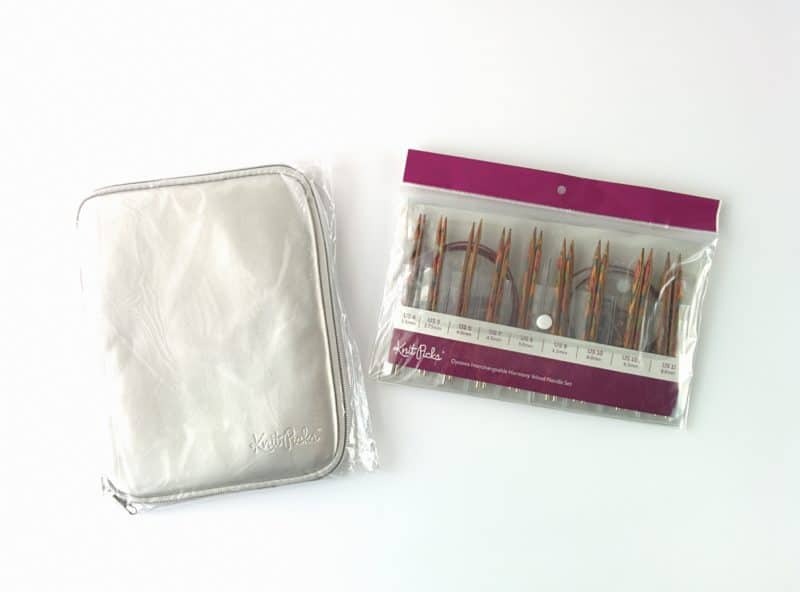 Interchangeable needles come in a set with different sized needle tips that screw onto different lengths of cable. That way, you can adjust your needles to your project. These are the ones I recommend, whether you’re a pro or you’re learning for the first time in this Knitting For Beginners Series. There’s more of an upfront cost to these types of needles, but they are worth it. They last longer and you can do so much more with them. I bought my set 10 years ago when I started and have only added 1 or 2 extra needles since then. These Knit Picks ones are my favorite and the ones I will be using throughout this series. I actually have the nickel plated set which has smoother needles but they’re also more slippery for faster knitting. For beginners, I think the wood ones would be better because they are a little tackier and you’ll be able to control the stitches better. Whichever you decide to pick, you’ll be able to follow along. So if the circulars are out of your budget right now, don’t worry about it. Just get the straight needles. Knitting is a fun thing, so don’t worry about have expensive materials. Obviously, you’re going to need some yarn for your knitting. Now before you run off to the store and grab the prettiest yarn you can find, let’s talk about what’s going to work best when you’re knitting for beginners. You want a chunky or super chunky yarn so that you can easily see the stitches you’re working. You also want something smooth, so avoid any of the yarns that look like hair or are curly in texture. Don’t worry about material too much. Any acrylic yarn or a wool blend will be great. Stay away from 100% wool though. It doesn’t unravel easily if you make mistakes and need to go back, plus it’s usually more expensive anyway. My favorites for beginners are Lion Brand Hometown USA, Wool-Ease Thick & Quick, and Bernat Softee Chunky. You can get all of them on Amazon or check your local Joann Fabrics and Michaels. Simple enough, but you’re going to need a good pair of scissors too cut your yarn. Get a new pair and use them ONLY for your yarn to keep them sharp. Using them on other crafts can dull the blade out and then they won’t cut the yarn cleanly anymore. You’re going to need a fabric tape measure to check the size of the pieces you make and to make sure everything fits. You can use a ruler too but a fabric tape measure is more flexible and you’ll be able to adjust your measurements more easily with something that can be moved around. I love this one from Knit Happy and I’ve had it for years. A tapestry needle or a blunt tip needle is another essential tool you’ll need in this Knitting for Beginners series. It’s a needle that has an eye big enough for yarn to go through it and a blunt tip so you can use it easily through big stitches. They’re super affordable and really help polish your knitting by weaving in the ends and hiding stray yarns. Lastly, you need some stitch markers. These are little plastic safety pins that you can clip onto your work. Use them to remind you where the first stitch is or section off a part you want to do differently. They are especially helpful when you start working in the round and learning new stitch patterns to create different fabrics. But for beginners, they’re just helpful when you need to mark your space. I use these Clover ones. Most of you reading this might already be crocheters, so you’ll have plenty on hand. But for those who don’t, I’d recommend getting a crochet hook. They really help when you make a mistake or drop a stitch. A crochet hook is also a great way to learn when you haven’t quite mastered how to hold the knitting needles. I’ll show you how you can use a crochet hook to help with the trickier bits. You only need one size, so I would get and 8.00mm hook to have on hand. The full price of all of this is less than $50. If you get the Knit Picks needle set, it’s more like $100, but well worth it. 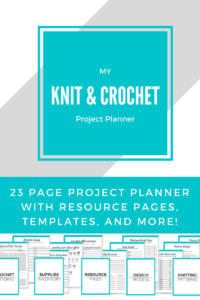 You can buy the yarn as you go and move on to each project in this Knitting for Beginners series, but the rest of the tools are things you are going to use all the time and worth investing in. I can’t wait to dive in and start sharing the first tutorials and patterns with you! To make sure you don’t miss them, sign up using the box below. You’ll be added to the email list which gives you access to freebies in the resource library and the weekly newsletter to keep you update to date with posts on The Blue Elephants. So gather all your materials and I’ll be back with the first lesson soon!